I am so excited to announce that I am a new contributor to not one, but two new blogs. 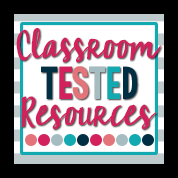 I have thoroughly enjoyed being a part of my first collaborative blog, Adventures in Literacy Land, and recently, I was invited to become part of the iTeachSecond team and Classroom Tested Resources too. I thought today would be a great reason to write about what I've gained from these experiences. Reason #1-Blogging with a team provides a virtual PLC. If I am teaching something and need quick help with a plan or idea, in a moments notice, I am able to contact a crew to help me with the issue. This gives participating teachers a wide variety of ideas from many parts of the world. Reason #2-Blogging on a collaborative blog encourages teamwork. When kicking off the blog, it takes many hands to make work light for sure! Of course you need a strong leader, but each of the participants has helped pull the blog together to make it helpful to the readers. Teachers follow bloggers from many different social medias, and no one is an expert at them all. By dividing up the duties, we can build on each other's strengths. Adventures in Literacy Land specializes in sharing literacy tips, research, and resources. iTeachSecond specializes in sharing materials and ideas for the primary grades (second grade in particular), and Classroom Tested Resources will be sharing ideas on common themes across a variety of grade levels and content area. All three blogs will provide me with a different network of teachers. Reason #3-You can become great friends! I have thoroughly enjoyed getting to know all these great teachers. We all support each other's endeavors and have become virtual penpals. Last week, I got to meet up with these great gals, and do you know we sat in our booth for almost *6* hours! I am not kidding. I have not laughed that hard in a long time, and we can not wait to meet up again. I am looking forward to meeting my bloggy buddies from other regions of the US and world in Vegas in July, and if you're going to be there and read my post...comment, okay! I love that I can gain a broader perspective on what's happening in grades below what I teach as well as in the middle school and high school. There are lots of times when I have questions related to my own children's education or am looking for help for a parent. It is wonderful to be able to find someone I can quickly talk to. Likewise, readers are able to feel confident that the group will be able to help them regardless of their needs. Reason #5-Collaborative blogs offer great giveaway opportunities. That is a lame reason I know, but for today, I needed to add this reason because I do not want my readers to miss out on these amazing Swag Bags. Look at the great goodies that will be delivered to *three* lucky winners. You can enter jump over to Classroom Tested Resources for our kick off celebration by clicking the image below..
Well, I believe that wraps it up for me today. I am ready for some ZZZZZ's because tomorrow will be an exciting day! 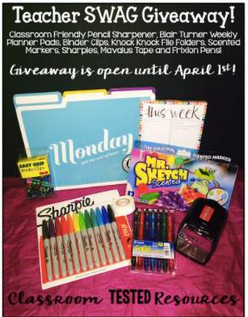 Good luck to those who enter the giveaway, and come back to soon for more teaching tips, ideas, and materials. Happy Friday! Love this post Carla! I am excited to be a part of my first collaborative blog and learn from you! Can't wait to meet up this summer, Kim! It is going to be ahhhh-maze---ing! I have really thought about offering to join one, but I am so bad about blogging on my own blog! I am afraid that I won't be able to keep up. I don't want to let anyone down! I love the collaboration and the feeling that I am not alone! I am seriously considering offering up myself to join one. Amy-message me if you are serious about joining a collaborative blog. I just learned the iTeach blogs are extending to 3-5. Great Post Carla, clever! I'm thrilled we are in this adventure together!! and I hope you'll travel north in July to meet me, Stacy! That would be so awesome! If you have time, we'd love for you to join our group, Michelle! Message Andrea and let her know! Your blog looks fantastic! You are such a literacy expert that I am glad to know you! #6 would be that you inspire so many more teachers through your posts and expertise to engage actively in the collaborative blogging world. Thanks for being such a motivator! You have made my day, Erin Beers!! 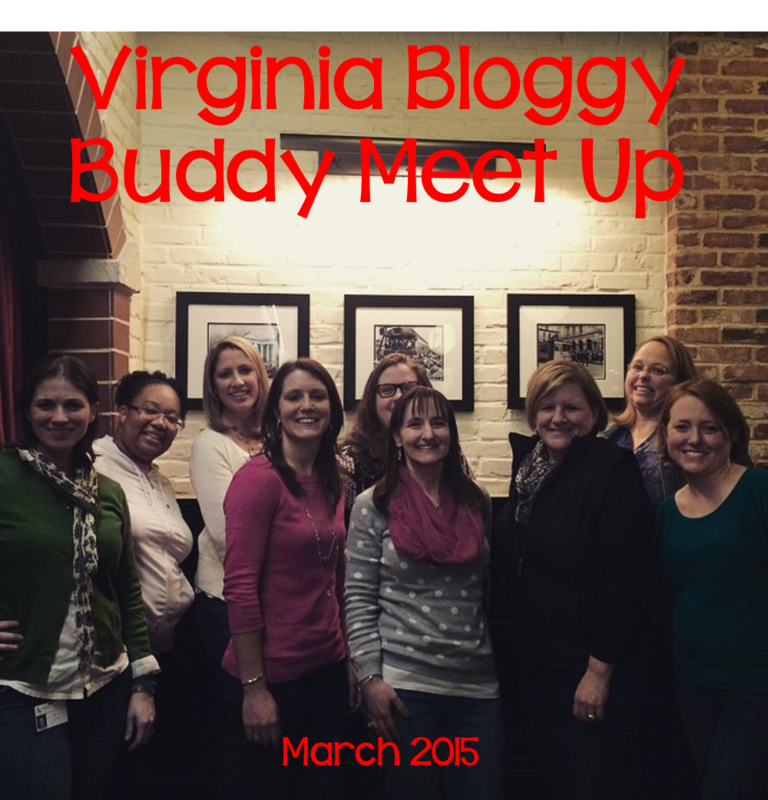 I love it and all the bloggy friends I have made!